There is widespread agreement about the urgent need to broaden the diversity of people who participate in, contribute to, and benefit from science, technology, engineering, and math—the disciplines collectively known as STEM. Nondominant populations in the United States have been dramatically underrepresented in STEM academics, professions, and civic decision making due to a system-level failure to recognize, nurture, and channel all young people’s early interests in STEM into longer-term pursuits or to adopt inclusive approaches for adults participating in STEM events or learning experiences. “Broadening participation in STEM” generally means increasing the participation of people from historically underrepresented communities in the pursuit of STEM studies, professions, and civic decision making. In this view, the challenge and the solution focus primarily on creating access to existing pathways into STEM and on increasing the number of those pathways. The assumption of this approach is that when points of access are increased, more diverse and more representative populations will have more opportunities to participate in STEM and will pursue those opportunities. Efforts to diversify the STEM workforce often use the “STEM pipeline” metaphor to describe the need to get more diverse populations on a journey toward STEM careers. This approach has been critiqued for not incorporating evidence that people find different ways into STEM careers and that STEM understanding and education can be applied in many ways beyond careers (Cannady, Greenwald, & Harris, 2014; Vossoughi, Hooper, & Escudé, 2016). In contrast, the “STEM pathways” metaphor has been used to describe a system with many entry points and trajectories for STEM engagement. Both metaphors, for the most part, rely on interventions or learning experiences that adopt normative academic and professional models of what STEM professionals and practices look like—the same models that are historically associated with the exclusion of nondominant communities from STEM. We propose an additional way to broaden participation: conceptualizing participation as a means of personal and community agency. This model explicitly builds on the myriad ways that STEM is valuable to individuals and communities not only in career choices but also in everyday life and in concerted solutions to community concerns (U.S. National Academies of Sciences, Engineering, and Medicine, 2016). This means that STEM is presented in a significantly different way: as a means for personal or community agency and transformation. Success at broadening STEM participation is achieved because these programs do not rely on models that try to draw people to STEM but rather integrate STEM into where people are in their daily concerns, interests, and activities. It is important to consider how people are asked to engage with STEM, specifically how those programs and experiences may welcome the wide range of cultural assets different groups bring to STEM. As most audiences for public engagement with STEM in the United States are white, college educated, and middle class, this lack of diversity, in and of itself, may keep people in other communities from feeling fully welcome or comfortable. Beyond diversity of participants, frequently the means of participating—the ways of speaking, working, and acting—are also not diverse. In the United States, successful (rewarded) engagement in STEM activities is often characterized by individual achievement (the “lone genius”), verbal argumentation, challenges to authority, a strict division between the animate and inanimate, and a mind-body duality, including a separation between reason and emotion. Some of these cultural norms are highly valued in STEM fields. However, they may be seen as rude, inappropriate, or conceptually misguided in nondominant communities, which may instead emphasize collective decision making, deference to elders, joint meaning making, and other more cooperative norms. If individuals feel that participating in STEM requires them to leave their cultural norms behind—to change themselves, to reject the norms of their families and home communities—they may choose instead to reject STEM disciplines. Furthermore, when programs and organizations do not intentionally design engagements to integrate the cultural norms of nondominant communities, designers easily default to deficit-based approaches—seeing difference as a deficiency or a problem rather than a resource. Organizations that seek to make broadening participation a priority will take a holistic approach that considers public-facing activities as well as internal organizational culture. They will make inclusion explicit in strategic plans, rewrite the mission and goals to integrate equity and inclusion in meaningful ways, establish accountability, embark on listening tours with community groups, invite community members to present expert knowledge, write inclusive mission and vision statements, and have diverse board members and trustees. Internally, leaders will hire diverse staff, work to create an atmosphere where staff can begin to examine organizational norms and their own unconscious biases, learn to identify and counteract daily microaggressions, and articulate what an inclusive organizational culture looks like. Truly expanding and diversifying STEM participation will take coordinated and comprehensive efforts to create seamless systems of support. Some STEM learning ecosystems are very rich: They have many places and people who can support STEM learning. Some are fragile: They have few places and people to support STEM; if one of them disappears or changes, there can be adverse ripple effects in the ecology of STEM learning opportunities. Research shows that most people who successfully pursue STEM engagement and careers have grown up in families and communities that include a variety of role models and mentors; strong, innovative STEM programs in and out of school; and access both to STEM-rich cultural institutions, like museums and science centers, and to resources such as films, journalism, and social media (Engberg & Wolniak, 2013). For many communities historically excluded from STEM fields, including immigrant families new to the United States, opportunities to engage in STEM, social networks to support STEM participation, and an understanding of how to navigate the ecosystem of STEM engagement opportunities remain elusive and sometimes even invisible. This challenge is compounded when existing investments in STEM engagement opportunities remain siloed and uncoordinated across the STEM learning ecosystem. Efforts to strengthen STEM learning ecosystems focus both on building out the ecosystem—creating more and better opportunities for learning—and on helping learners navigate the ecosystem by ensuring that they can find and pursue ongoing opportunities to expand their participation in STEM. 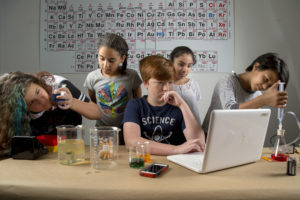 Over the past year, the Center for Advancement of Informal Science Education (CAISE) has convened a task force of 15 leaders in science communication and informal STEM education to identify challenges and opportunities both fields face in contributing to systemic efforts to broaden participation in STEM. For a complete list of the task force members, see below. With the help of an additional 13 contributors, the task force has created a set of professional development resources that can support individual and organizational approaches to broadening STEM participation. These resources are currently being piloted. If you would like to be notified when they are released in early 2019, join the CAISE email list here. Bronwyn Bevan (bronwynb@uw.edu) is a senior research scientist at the University of Washington and co–principal investigator (co-PI) of the Center for Advancement of Informal Science Education (CAISE). Angela Calabrese Barton (acb@msu.edu) is a professor of teacher education at Michigan State University. Cecilia Garibay (cgaribay@garibaygroup.com) is principal of the Garibay Group and a co-PI at CAISE. Melissa Ballard (mballard@informalscience.org) is the communications and community manager of CAISE. Jamie Bell (jbell@informalscience.org) is the project director and principal investigator of CAISE. Task Force members: Raychelle Burks is assistant professor of chemistry at St. Edward’s University. Marc Lesser is senior director, Learning Design at Mouse. Nancy Maryboy is president and executive director of the Indigenous Education Institute and an affiliate professor in the School of Environmental and Forest Sciences at the University of Washington. Dale McCreedy is vice president of audience and community engagement at the Discovery Center at Murfree Spring. Sunshine Menezes is executive director of the Metcalf Institute for Marine and Environmental Reporting, and clinical associate professor of environmental communication at the University of Rhode Island. Nichole Pinkard is associate professor and director of the Office of STEM Educational Partnerships in the School of Education and Social Policy, Northwestern University. Christine Reich is vice president of exhibit development and conservation at the Museum of Science in Boston. Bruno Takahashi is assistant professor of environmental journalism and communication at Michigan State University. Bhaskar Upadhyay is associate professor of science education at the University of Minnesota. Danielle Watt is director of education, outreach, and diversity at the Center for Chemistry at the Space Time Limit (CaSTL) at the University of California, Irvine. About the image: Students study STEM. Photo by Christina S. Murrey, College of Education, University of Texas at Austin.